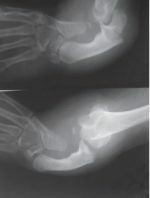 Authors: Venkata SG, Reddy GAV, Reddy AKKR , Chiranjeevi T.
Cemented Bipolar arthroplasty is an established method for treatment of comminuted Intertrochanteric fractures. Reconstruction of greater trochanter is an essential technical step to avoid complications like abductor lurch gait. 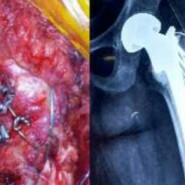 We here describe a technique of reconstruction and fixation of greater trochanter using cancellous screws with wide washers made of reconstruction plate and tension band wiring. This gives a stable fixation of greater trochanter and avoids cut out, slippage of implants.